We follow Lannes and Marche, 2014 and try to reproduce the experiment of Berkhoff et al, 1982. The numerical wave tank is 252 metres and periodic waves are generated on the left-hand side and are damped on the right-hand side. We turn off limiting to try to reduce wave dissipation. 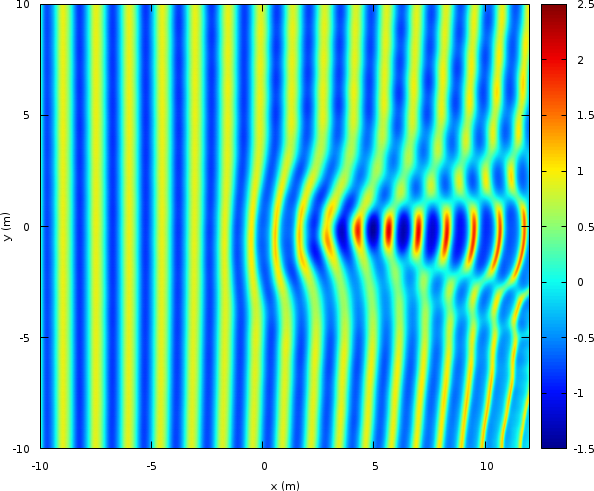 Periodic waves with period one second are generated on the left-hand-side. We tune the amplitude of the “radiation” condition to match that of the experiment as measured by wave gauges. We declare a new field to store the maximum wave amplitude. The bathymetry is an inclined and skewed plane combined with an ellipsoidal shoal. double zs = sq(xr/3.) + sq(yr/4.) <= 1. ? 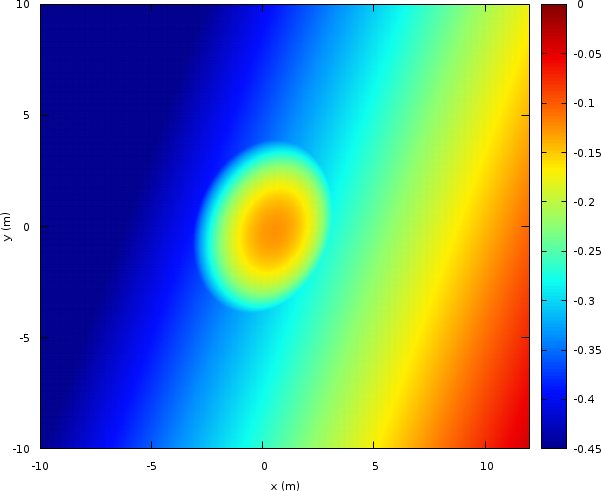 To implement an absorbing boundary condition, we add an area for x>12 for which quadratic friction increases linearly with x.
Optionally, we can make a “stroboscopic” movie of the wave field. This is useful to check the amount of waves reflected from the outflow. After the wave field is established (t>=40) we record the maximum wave amplitude. 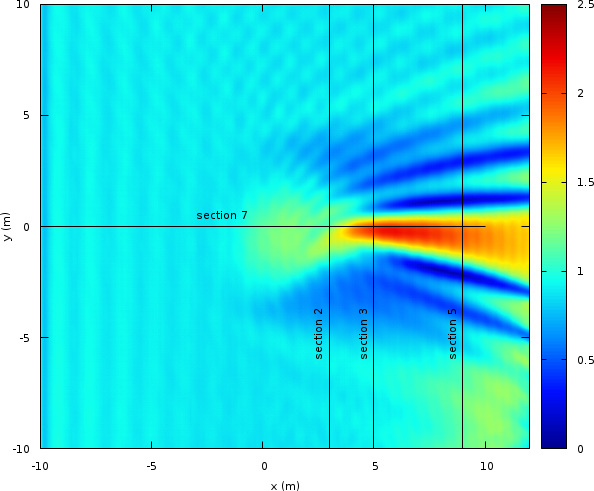 At the end of the simulation, we output the maximum wave amplitudes along the cross-sections corresponding with the experimental data. The results are comparable to Lannes and Marche, 2014, Figure 19, but we have to use a higher resolution (10242 instead of 3002) because our numerical scheme is only second order (versus 4th order).